Crostini is one of the most perfect appetizers. You can use your imagination to dream up wonderful combinations to top a crusty piece of bread with. 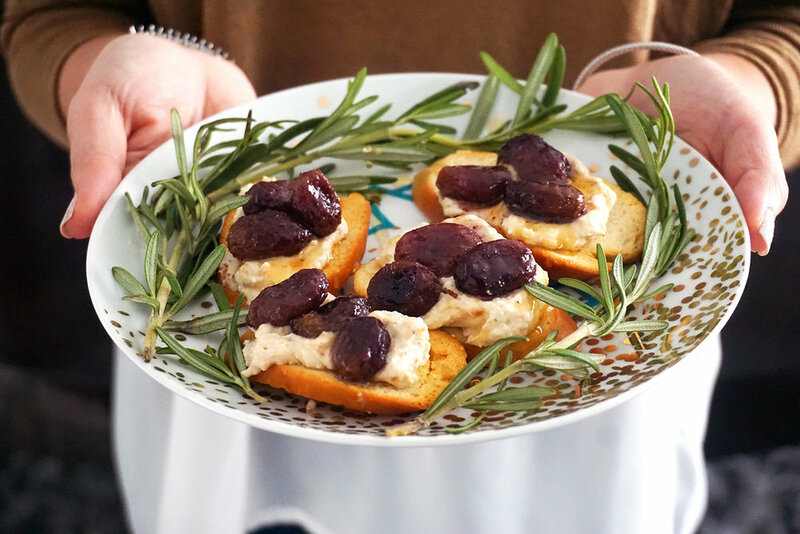 This roasted grape crostini with a chili laced ricotta is one delicious bite. Drizzled with honey and sitting on top of New York Style Panetini this is a great way to start a party or bring to your next holiday gathering. The New York Style Panetini is an oven baked Italian toast that adds the perfect crunchy contrast to the creamy ricotta and is available in three delicious flavors: Garlic, Garlic Parmesan and Original. Roasting the grapes concentrates their sweetness and adds depth to their flavor. The roasted red pepper chili paste is sweet with a little kick. The chili paste mixed with really well with the Ricotta creating the perfect layer for the grapes to sit on top of. 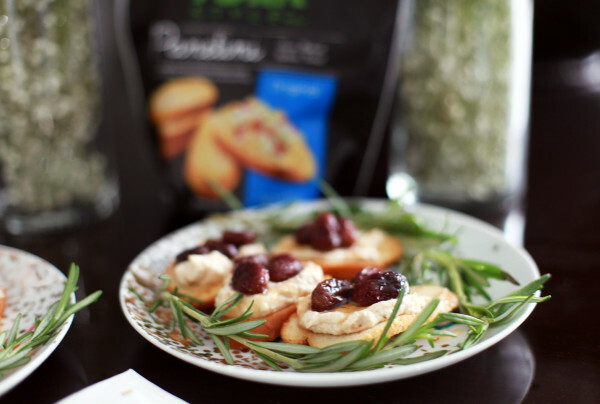 Finishing the crostini’s with a sprinkle of sea salt and a drizzle of honey gave it just the right notes! On a baking sheet toss grapes, olive oil, salt, and pepper. Make sure the grapes are coated with the olive oil. Roast for about 15 minutes until the skin on the grapes become wrinkly, soft, and start to pop. Meanwhile, in a bowl mix together the ricotta, salt, pepper, and chili paste until well combined. Arrange the new york style panetini on a platter. Spoon about a tablespoon of the ricotta mixture onto each one. Once the grapes are done roasting, remove them from the oven and let them cool for 10 minutes. Then layer the grapes on top of the ricotta. Usually 2-3 grapes fit. Drizzle honey over the top of the assembled panetini and sprinkle sea salt or a any other flaky salt over the top and serve!